All-Sports Photo Memory Folders as seen above. 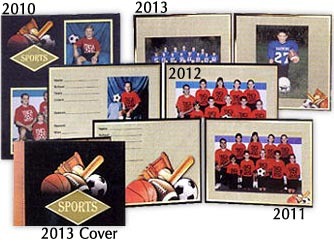 • Choose from a selection of sports folders with several useful opening sizes. • Sturdy Multi-colored folders with Gold foil you can insert photos from their sides. • The ''All Sports'' emblem allows their use in many sports making fewer styles to stock. • Made to stand on their own with a simple fold. • See link after you select ADD TO CART to personalize with foil! 75/35V Contain a 7x5 horizontal & 3 1/2 x 5 vertical image.